Djawundil is from the Gumatj clan. Djawundil Maymuru is a co-author of two books, Welcome to My Country and Weaving Lives Together. Djawundil currently works with Bawaka Cultural Experiences, a highly successful Yolŋu owned-and-run Indigenous tourism business. 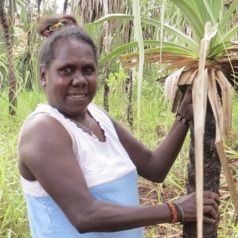 As a key member of the business, she works with visitors to Bawaka to share life at Bawaka with them, helping them understand and respect Yolŋu culture and land. She is a college graduate and has been on the board of Laynhapuy Homeland Association. Djawundil has also been invited to share Yolŋu knowledge at conferences and seminars in New Zealand, Canberra, Sydney and Newcastle. Djawundil is a member of an Indigenous-academic collaboration with academics from Macquarie University and the University of Newcastle and is an Honorary Associate of the Department of Environment and Geography at Macquarie University.